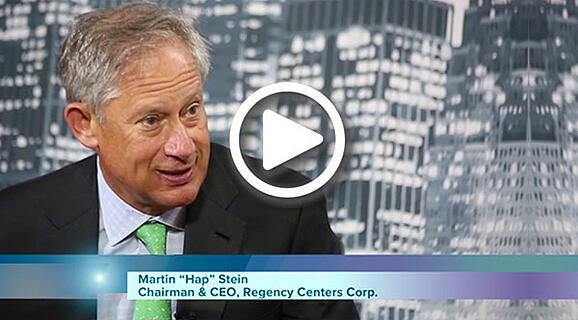 Martin “Hap” Stein, chairman and CEO of Regency Centers (NYSE: REG), joined REIT.com for a video interview at REITWeek 2017: NAREIT’s Investor Forum at the New York Hilton Midtown. The merger has allowed Regency to enhance its presence in key markets and improve its net operating income (NOI) growth rate, according to Stein. As an all-stock transaction, Regency has also been able to enhance its balance sheet, he said. “It’s been a great merger for us,” he said. Meanwhile, Stein said Regency’s portfolio can withstand the disruptive forces playing out in the retail landscape. “The key to being successful is quality. It’s never been more important than it is today,” Stein stressed.